Let hope that iRobot did not change the design from 700 to 800 series. UI boards, all sensor arrays, interchangeable, if that's any consolation. The close up photos Vic7767 took, in this thread, will let you know right away. (G0, G1 = the left mosfet, G2, G3 the right one, counting from left to right when the front of the roomba is facing you). Are we measuring the pins 5/6/7/8 of each MOSFET? I think they are their gate readings. Pins 4,2,4,2 of Q60, Q59. G0, G1 = the left mosfet, G2, G3 the right one, counting from left to right when the front of the roomba is facing you). For some reason, I was thinking STS8C5H30L instead of each MOSFET inside STS8C5H30L. I was counting the left wheel STS8C5H30Ls with the right wheel STS8C5H30Ls. LOL Too late at night! Last edited by TechGuy on September 17th, 2016, 5:08 pm, edited 3 times in total. You have the backward right, now for the upside down. Skip that, run BIT 15 both wheels reverse. You can check left to right and identify those problems first before having to switch between BIT 14 right forward and BIT 13 left forward. a1robotrepair wrote: Checked my notes. Forgot about D63 & D64 reverse biased Schootky diodes used to collapse the motors EMF while stopping or slowing down. They are from the motor connection contacts pins 1 and 2 to System Return, bypassing the motor current sense resistor. They will have a very low forward break over voltage, below 0.2V current dependent. If one of the FETs has failed closed or driver circuit is exciting the gate, spinning the wheel will try to push current against itself. Can you provide a location for these diodes? T/S 700/800 H-Bridge Basics. Most of the time I find bad solder joints, shouted component connections from gunk or blown traces. Bad solder joints are usually found at the module connector or the Transistors and diodes delivering power to the module connector. Blown traces are usually between VBAT and Pin 1 of the Transistors, SysRtn to current sense resistor to Pin 3 of the Transistors or from Pins 5/6 & 7/8 to the Schottky diodes to the module connectors. Start @ Pins 2 & 1 of the wheel connector solder joints. I will start by checking continuity the above circuits. If that checks out, I'll run the corresponding BIT with the module removed. The module has already been tested...running and not high current. Don't forget, the system monitors current and sets a PWM current limit. 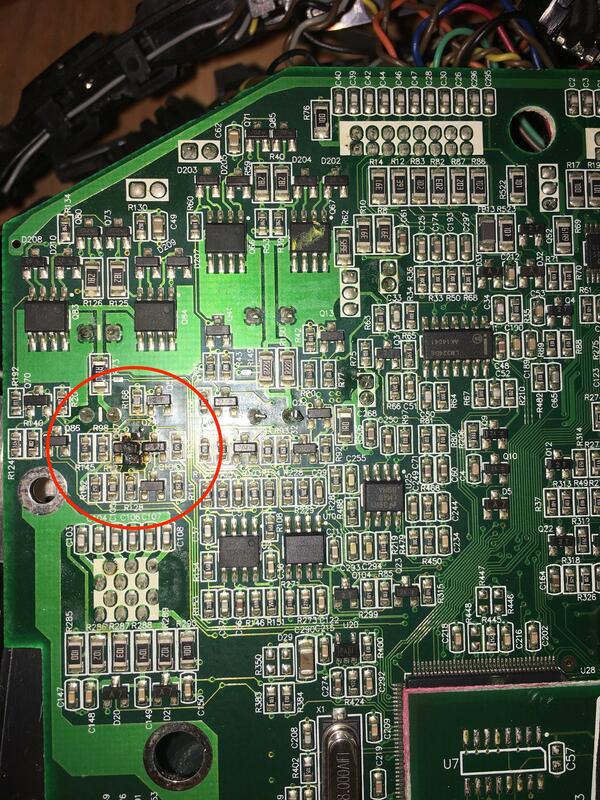 The traces on bottom of PCA will lead you to the Schottky Diodes. Next pic of their PCA solder joints. Then check pin 3 of both duo FETs to SysRtn for battery voltage. Then check VBAT to pin 1 ...for battery voltage. Check forward +V FET pins 5,6,7,8 to SysRtn for battery voltage, right wheel Q60. Check forward -V FET pins 5,6,7,8 to VBAT for battery voltage, right...Q59. Now check the 2 above with a load, don't be suprised if the motor starts running. Pressing down on the FETs may show its problem. If you have a Wiggy Voltage Solenoid Meter, use it. Battery V on both FETS Pins 5,6,7,8 forward BIT problem with -V FET or -V FET circuit. SysRtn on both FETS Pins ... +V FET. My notes on the rest of the circuit are not good, I was in a hurry to fix one and get it out. Anyone who traces it farther, please add your notes, see page 2 this post for dwg. That dwg. MCU 28-122 was confirmed by another RR member as fwd/rev bit, 0 fwd, 1 rev. Last edited by a1robotrepair on March 27th, 2018, 9:42 pm, edited 6 times in total. Thank you for the update. My 880 left wheel R73(right wheel R96) is open. There must be large current going through it. I will do more work with your new info when I have a few hours. I have a few C3035LD on hand if I need to replace them. I have a problem with left wheel in my Roomba 880. I replaced few transistors, everything looks fine, but left wheel rotate very slow Wheel module is ok. Without wheel module everything is fine. Q93 counterpart is the common device to both P channel FETs gates. Look for your problem in that area. SysRtn on Q77, Q88 counterparts. R132 counterpart not shorted. I have a roomba 870 and I have the same problem with the left wheel not working and having resistance when it is connected. I have disassembled the board and attached some images of it. 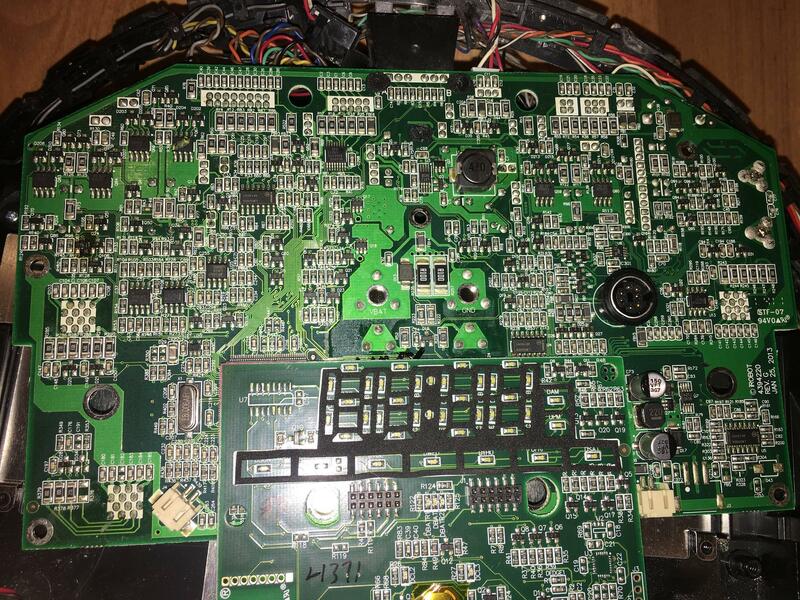 I saw that one component seems to be burnt, but I can't figure out what's it called, and where should I find it. I don't have much experience with electronics, what should I do? Q24 serves the same purpose as Q25 in the right wheel circuit. Q87 serves the same purpose as Q89 in the right wheel circuit. I would also expect a problem with Q83 N channel and D55 D56. The entire circuit needs checked. You will probably find the board trace is fried also. Nice Pictures, I was able to tell the devices right wheel counterparts from them. a1robotrepair wrote: Q93 counterpart is the common device to both P channel FETs gates. Look for your problem in that area. SysRtn on Q77, Q88 counterparts. R132 counterpart not shorted. Maybe a problem with the measurement of the current drawn by the wheel, so the motherboard gives less voltage? R93 counterpart may have changed due to high current. Should be 0.1 ohm. Remove battery before R checks. I have changed R96 counterpart. Time to get out the o-scope. Check V on both sides of C90 and counterpart. Look to see that comparator inverting inputs are the same. I have this Irobot 775 for 4 years. I found the battery defective and gave me the error 5. I replaced the wheel module and it gave me the same error. Once opened I found the defective engine driver q59 and r96. Change driver whit fds8958a and resistance no longer give the error but the wheel always turns while on the left it remains still. If I push the reset button, it turns in the other direction. who can you help me?